Like most product teams, ours at Pendo always has a lot going on. We’re constantly balancing the need for speed with the desire to be more innovative. We also understand the value of empathy and working closely with our customers. In fact, one of our company’s core values is “Maniacal Focus on the Customer.” Each individual on our team focuses on getting it right for the customer—not being right individually. There’s a big difference. Falling in love with your own ideas can bias decision-making. When focusing on solving the customer’s problem collectively, you’re more willing to drop your own ideas in favor of those best suited to solve the problem. Over the past month, we’ve been experimenting with new ways to “paper prototype”: to expose our latest ideas to customers and quickly iterate based on their feedback. Our goal is to innovate faster and bring our customers along for the ride. While this approach doesn’t represent our complete innovation system, it has improved our feedback cycles by 10x and has maximized our rate of learning. In the outline below, I’ll highlight a few tools and processes we’re leveraging as we experiment with rapid prototyping and feedback—all in service to building a better product that customers love. Our fast-paced approach to prototyping comes from a “doing is the best thinking” mindset. To me, that means less discussion and debate and more experimentation and testing of assumptions. Doing provides the inspiration and insight that leads to true innovation. I typically sketch out my earliest thinking in Evernote. As a product guy, Evernote is always my preference— all of my notes are there. Mocking up a low-fidelity idea is quick and easily shareable (and searchable). I typically sketch out five to seven different solutions for any given problem. Pushing yourself beyond your first one or two ideas can be uncomfortable, but often yields the most creativity. Once I’ve completed my handful of sketches, I look for high-level feedback from customers and even prospects. Using Pendo, we’re able to expose feature prototypes to our customers in-app (and in context) by leveraging the Guides feature. 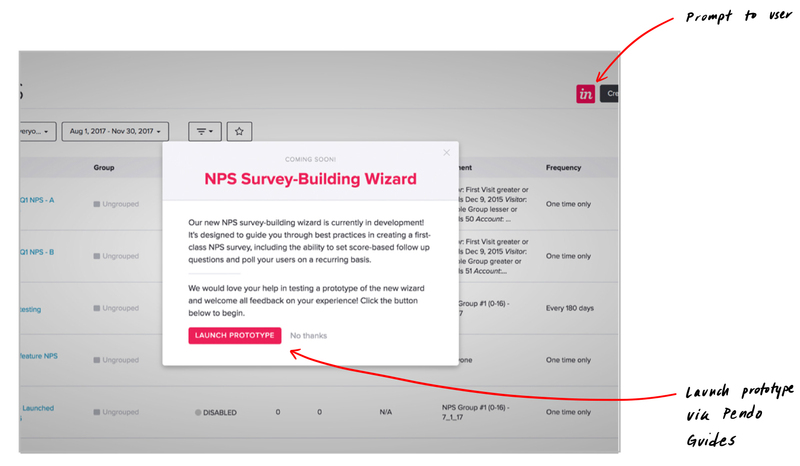 Once a user opts into the prototype, we surface a clickable sketch powered by InVision, to walk them through the new idea, different user experience, etc. At the end of the prototype, we present the user with an opportunity to provide feedback. This strategy is a work-around from my past techniques, mostly because our industry is B2B. When I worked with consumer and small business-focused products, I used UserTesting.com as well as Mechanical Turk to get early feedback on new ideas. This isn’t an much of an option with most B2B products simply because of the targeted audience and subject complexity. In my case, it’s difficult to find a product manager or customer success manager to give feedback on an analytics product on user testing sites. This constraint in B2B has forced us to be more creative—or innovative—when it comes to rapid feedback. Once we’ve exposed a few ideas to customers, we’re able to review their feedback by reading the comments at the end of the prototype walkthrough. We use Freehand to discuss feedback and highlight areas of future iteration. We do this specifically because I’m remote in New York City and need to collaborate online, mostly via video, with my team in Raleigh and Israel. From the discussion, our design team takes the next pass—higher fidelity, more dialed in. In this example, the next iteration included a move to a wizard-like experience to walk users through a relatively complicated set-up experience. By now, I’m much less involved in the iterations, but I do stay close to the discovery process and the team’s key learnings and recommendations. At this point, we’re ready to push the next iteration out to our customers. We go through the same process as before, encouraging customers to open the prototype in app. Our prototype is again surfaced through InVision. Here’s what the customer experiences from discovery of prototype to providing feedback. pendo+invision_v5 from Brian Crofts on Vimeo. Now we move to my favorite part of the process: the customer feedback. In this particular case, we collected helpful feedback within 24 hours and had encouraging support to continue investing in our idea. But this approach can also quickly highlight or uncover reasons to pivot and take a different path (like the earlier example). At this stage, It’s also important to remember that written feedback has its limits. Customers are less inclined to write lengthy, in-depth responses. And unlike an in-depth interview, we can’t follow-up with questions real time to better understand their feedback. To improve on our first experiments with prototyping in-app, we’ve added an option in the prompt for feedback (see above) to schedule a call with one of our designers and/or product managers. This happens directly through a Calendly connection to remove the time-consuming effort of coordinating calendars for scheduling conversations and working sessions. 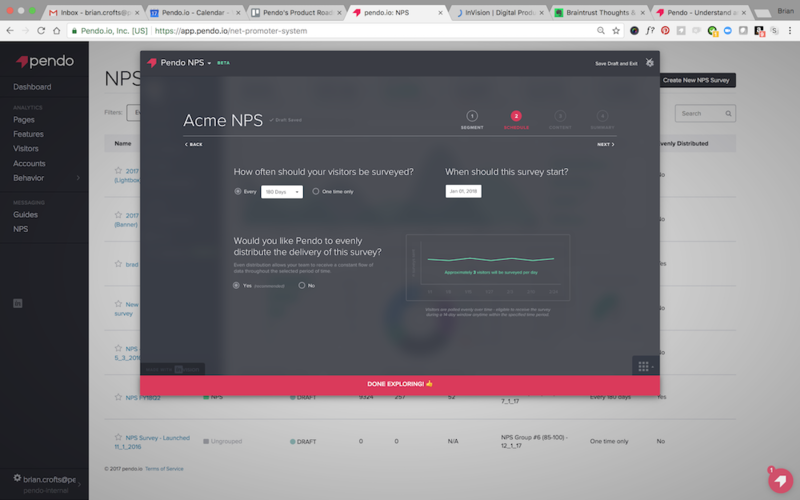 We’re seeing a 50% completion rate for those who started the prototype, finished, and left feedback, all positive indicators that our customers are finding this approach helpful and engaging. Our team is also having fun with this new strategy. It’s keeping us continuously connected with our customers and feeding our passion for maniacal customer focus. Through this entire process, we’ve been able to engage our users in an efficient, effective, and unobtrusive way. 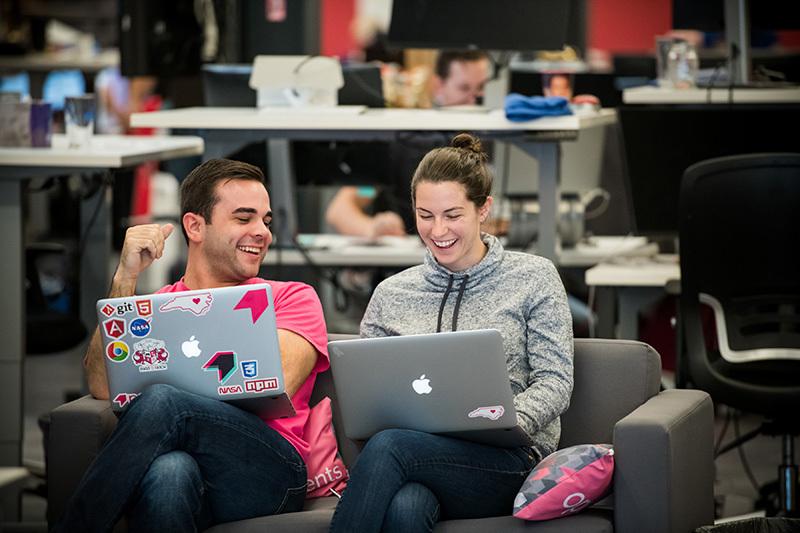 It’s also encouraged us to continue to iterate as a team, both leveraging different tools and new processes to ensure we’re on the path to creating a product customers love. Poornima Vijayashanker is the founder of Femgineer and was previously the founding engineer at Mint.com, where she helped build, launch, and scale the product until its acquisition in 2009. She's also been an entrepreneur-in-residence at 500 Startups, a lecturer at Duke University's Pratt School of Engineering, and the author of How to Transform Your Ideas into Software Products and Present! A Techie's Guide to Public Speaking. Poornima holds degrees in Electrical and Computer Engineering and Computer Science from Duke University's Pratt School of Engineering.